On Sunday 17th March, Khushi The Cow and friends will be Bollywood dancing and promoting Khushi Does Bollywood at Sainsbury’s FUNraiser for Comic Relief: Red Nose Day 2013. 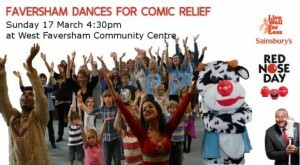 ‘Faversham Dances for Comic Relief’ starts at 4:30pm at West Faversham Community Centre. Tickets can be bought from Sainsbury’s in Faversham. All money raised for Comic Relief.